Just holding this book in your hand evokes a sense of nature, creativity and simplicity. The soft brown paper cover and the delicate nature illustrations bring a sense of inspiration, evoking images of mossy woodlands, den building and woodland treasure hunts. 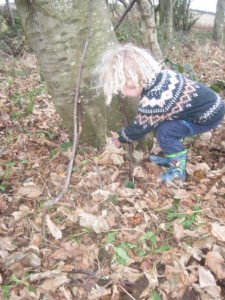 This book is hugely practical, the short introduction explains the ethos of Forest School and how to work with children so the activities feel like Forest School – excitement, adventure, child led in a natural environment where as adults we are engaged and curious alongside the children’s learning. 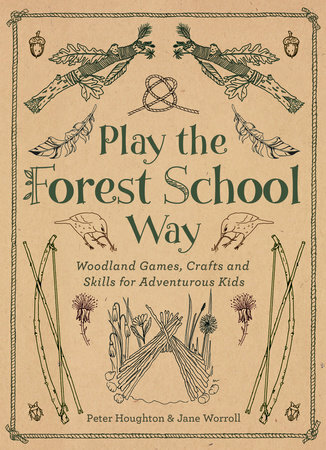 The book details activities for exploring the woodland, making nature art and craft, survival skills and wildlife team games. The simple introductions bring background historic and cultural knowledge to the activity, and the instructions and suggestions make the activities accessible and adaptable to the different ages and interests of the children. We loved making the journey sticks, where we took a walk through the woodland, collected natural items that caught our eye and then wove them onto a stick using coloured yarns. We then transferred this activity to a beach session, collecting shells, mermaids purses and seaweed and weaving these with sea-inspired colours. The book provides great ideas and inspiration for adults interested in the children they care for being creative and engaged with nature. The book is a perfect companion for Forest School practitioners, providing ideas for games and crafts to add creativity and adventure to their sessions. Similarly, this book is valuable for parents looking to brighten up a nature walk and invoke a sense of excitement and imagination in family time outdoors. We found the activities great springboards for the children’s imagination, and as we presented an idea it was great to see how the children ran with this, adapted it to their interests and the environment and made it their own. A beautiful, practical book to add to the family book shelf, to inspire a nature birthday party, connect to the outdoors with your little ones and add a creative twist to a family nature walk.